EUROPE: Recent project progress from ScottishPower Renewables' 1.2GW East Anglia Three as it begins on the planning process, Eneco's Norther site and the Burbo Bank Extension in the Irish Sea. Planning process: The Planning Inspectorate's examination of East Anglia Three will commence next month, with the preliminary meeting arranged for 28 June. Loan considered: The European Investment Bank (EIB) is considering Eneco's application for a €450m loan for Norther. The 370MW project is a joint venture between Eneco and Elicio and planned for a site in the Belgian North Sea. Charter commences: With offshore construction about to commence, Seacat Services has begun operations at the 258MW Burbo Bank Extension project in Liverpool Bay. 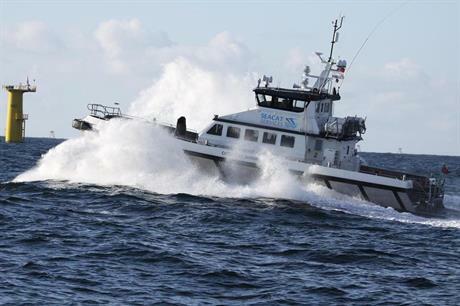 It will be providing four crew transfer vessels – Seacat Defender, Seacat Volunteer, Seacat Vigilant and Seacat Endeavour – to support the installation of turbines and the offshore transmission infrastructure. Dong Energy has chartered the vessels for periods of three to 11 months.